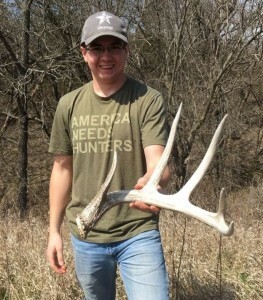 Tyler Knott of Iowa is still shed hunting, and he just found this 72 6/8” left side. The late spring of 2018 has the woods still brown and open, with “green up” still a good week or two away. Conditions are great for one last day or two of shed hunting in an around bedding areas. Hit the woods, find a deer trail and follow it until you come to a thick and obvious area where deer stage and/or bed. Back in the fall hunting season you would have stopped, tested the wind and worked the outer fringes of such a sanctuary so as not to spook any deer. But now, plow right in. Go slow and look close for brown or white bones. If you hit 3 or 4 good bedding sites one day this week, I bet you’ll find one or 2, and maybe a big one. While you’re at it, note the rub lines, old scrapes and trails you’ll probably find in and around the cover. Get an idea of the easiest and best-hidden routes a mature buck uses to enter and exit the cover according to various winds. That intel will help when you come back to hunt the area this fall. This entry was posted in Big Bucks, BigDeer, Deer Hunting, Shed Hunting, whitetail deer by admin. Bookmark the permalink.